Do we have time for one last Retro Friday review for the year? I figured it ought to be a good one. And since I reviewed Daughter of the Forest a few weeks back, it seemed only right to close the year out with the sequel. Just another one of those perfect books I read before I started reviewing books and then sort of shied away from reviewing because it's well nigh impossible to do justice to a book you have all the feelings for, you know? It also happens that this is not only one of my very favorite books of all time but one of my favorite winter reads, as the night of Midwinter's Eve plays rather a large role in the story. Son of the Shadows is one of those unexpected wonders and another example of how to absolutely kill it with a sequel. 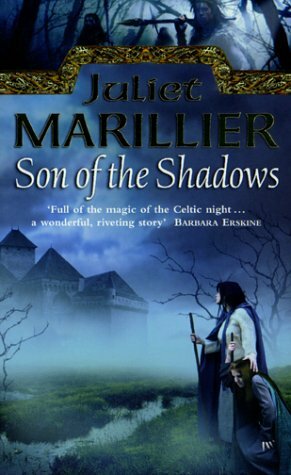 If you asked me if it was possible for Juliet Marillier to write a sequel as good as the first book, I would have immediately laughed out loud and uttered a resounding no. I truly didn't believe it was possible to follow Daughter of the Forest with anything that would even remotely measure up. Well, I was never happier in my life to eat my words. Because Son of the Shadows blew me out of the water. I finished it ready to say that it was not only as good as but better than its predecessor. I'm pretty sure I still think it is. It's hard because they're both stunning, and while Liadan is different from her mother Sorcha in many ways, she shares the strength and determination and goodness that made me fall in love with her mother. I love them both unreservedly, as I do both of these dear, dear books. If you haven't read this one, perhaps this winter is the perfect time to sink back into the world and family of Sevenwaters once more. My mother knew every tale that was ever told by the firesides of Erin, and more besides. Folks stood hushed around the hearth to hear her tell them after a long day's work, and marveled at the bright tapestries she wove with her words. She related the many adventures of Cu Chulainn the hero, and she told of Fionn mac Cumhaill, who was a great warrior and cunning with it. In some households, such tales were reserved for men alone. But not in ours, for my mother made a magic with her words that drew all under its spell. She told tales that had the household in stitches with laughter, and tales that made strong men grow quiet. But there was one tale she would never tell, and that was her own. Liadan has grown up surrounded by the love of her family and the peace and safety of the forest of Sevenwaters. The younger daughter of the beloved Sorcha--the young woman who sacrificed everything for her brothers and won them back from the clutches of the powerful sorceress Lady Oonagh--Liadan has tried to emulate her mother in every way. A talented healer, she spends her days making salves and medicines and taking care of the people of the keep. She is also a twin, an unexpected third child to her parents. And because she was unforeseen, her mother feels certain Liadan's path will be her own, that she is outside the pattern, and that her choices may have the power to change things for good or for ill. But Liadan has no idea just how outside the pattern her path will take her, until she is abducted on the road while on a journey to visit her sister. Taken by the band of the Painted Man, she is forced to offer her services as a healer or pay the price of failure with her life. From the tales whispered around firesides at home, Liadan knows the kind of ruthless killer the Painted Man is. And so she is determined to use her skills to save the man in question, and then return home to her family as soon as is humanly possible. But just as the Fair Folk took an interest in her mother's fate, an even deeper magic is at work in Liadan's. And though the outlook is bleak, and the people around her may not be entirely what they seem, the light of hope still burns as does Liadan's formidable will to survive. I sat there and made my breathing slow and calm, and told myself what I had told others many a time: Breathe, Liadan, the pain will pass. The night was very quiet; the darkness a living thing, creeping in around the two of us. I felt how tight strung his body was; I sensed his terror, and how he fought to conquer it. I could not hope to touch his mind, nor did I wish to see more of the dark images it held. But I could still speak, and it seemed to me words were the only tool I had for keeping out the dark. "Dawn will come," I told him quietly. "The night can be very dark, but I'll stay with you until the sun rises. These shadows cannot touch you while I am here. Soon we'll see the first hint of gray in the sky, the color of a pigeon's coat, then the smallest touch of the sun's finger, and one bird will be bold enough to wake first and sing of tall trees and open skies and freedom. Then all will brighten and color will wash across the earth, and it will be a new day. I will stay with you until then." The color of a pigeon's coat. One bird brave enough to sing of tall trees and open skies and freedom. That is Liadan. That is the power of her hope and her incomparable will. In this beautiful book of light and shadow, of choosing who you will be and protecting those you love, hers is the light that shines the brightest. You could do far worse than give your heart to her and to her story. It will be safe in her hands. Such a wonderful choice for your last Retro Friday review of the year! LOVED this book and like you, I think it's even better than Daughter of the Forest. Liadan and Bran *happy sigh* I can't thank you enough for encouraging me to read the Sevenwaters books - they're now included in my list of favorites. I have read this book and wondered how could she come up with something so amazing. Daughter of The Forest was one of my first fantasy novels and I had a hard time getting hold of this book but just like u said it was well worth all the trouble I took to find and read it! Loved ur review and those covers are lovely.. Happy New Year, Angie! 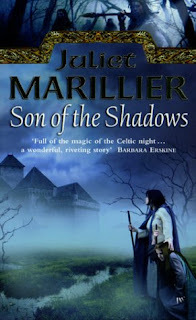 And thanks for the lovely heart-felt review of Juliet Marillier's Son of the Shadows. I have re-read it umpteen times since it was published, and now, after reading your review, I feel another re-read coming on! I think each of the first three Sevenwaters books are wonderful in their own distinct way. The last two are good, but the first three were better. 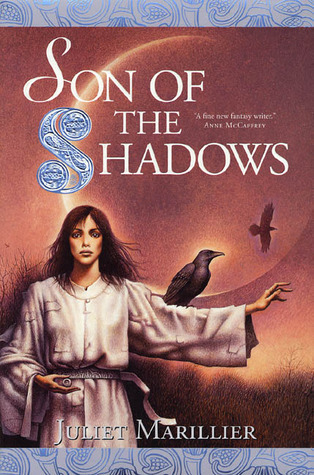 For a long time, Son of the Shadows was my favourite of the Sevenwaters books too. Liaden's love had huge obstacles - and it happened at a time when her family was undergoing a major upheaval as well. Her love was what healed the hero, who did not really have a name until she named him. A wonderful book, and highly recommended. I agree completely. Daughter of the Forest was great, and Sorcha's scenes had me in tears. That Son of Shadows would come even close to that impact was inconceivable, but it measured up. I still give the edge to Daughter of the Forest, but SOS was a very worthy sequel. Great review! I'm dying to read these books! I'd only heard feedback on the first book so it is good to hear that the second lives up to it! I think it might become my tradition to bring in the reading New Year with some Marillier. I picked up Heart's Blood at the library, but Daughter of the Forest is calling my name rather loudly! Lovely (as always!) 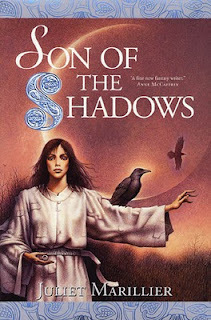 review of Son of the Shadows (here's my review if you're interested: http://bookreadingbookworm.blogspot.com/2011/01/i-will-fix-you.html). Have you read My One and Only, by Kristan Higgins? I just finished it, and it's right up there with All I Ever Wanted and Until There Was You. I know you're working through her backlist, so I'm sure you'll read it eventually! Oh Angie, another lovely review of a Sevenwaters book. Seeing all those covers reminds me that one day I must have the UK edition. That atmospheric blue says it all! 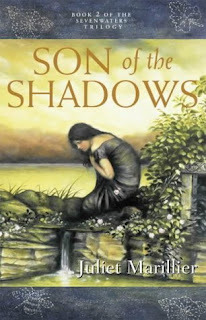 LOVE Liadan and Bran and love this book. Shweta, you, too? I love that DAUGHTER was one of your first fantasy novels. What a wonderful introduction to the genre. And this series really has had some great covers. I'd love to own them all. msaggie, Happy New Year! And you are most welcome. I love your comments on SON, too. Names have such importance in these books and I have always resonated with their power and the way Liadan transforms those around her with her words and her love. starlight, I understand. It's almost impossible choosing between them. L.L., oh my goodness. I love them all out of proportion. Please let me know when you do read them. Joanna, that would be one great tradition! I will definitely add your review to my links. And I have read MY ONE AND ONLY. I blew through her entire backlist but still need to review more of them. I definitely enjoyed it. Harper and Nick had such a hard time of it. Holly, I know. I want them ALL. lol.